Who Would Have Thought Touring a Louisiana Plantation Was a Good Activity for a Bachelor Party Weekend? I just got back from New Orleans, where a bunch of the homies and I took a Homie Trip to celebrate my upcoming nuptials. While what happens in New Orleans stays on Instagram, there were a few planned activities that were both fun and educational. For instance, we took an airboat tour of a swamp and I learned all about alligators and found out that on the bayou, marshmallows are simultaneously referred to as “swamp crack,” since alligators both love and can’t resist them. I was also much closer to an alligator than I ever thought I’d be in my life and lived to tell the tale. WIN WIN WIN WIN. But perhaps the most compelling excursion we took was touring a plantation. Louisiana is home to a vast number of famous plantations, many of which have been used in film. Two plantations we drove by on the way to the specific tour we paid for were locations for Django Unchained’s Candyland (Evergreen Plantation) and one stop in 12 Years A Slave (Felicity/St. Joseph Plantation). Our plantation stop was Oak Alley, a sprawling homestead that still had slave shacks standing and centered the lives of the slaves equally with the lives of the plantation owners. Put a pin in that. You might be asking yourself why a troupe of black men going to New Orleans for a bachelor party weekend would spend any part of that time on a plantation. And it would be a valid question. When we were all throwing out ideas for what type of good clean, God-fearing fun we could have in New Orleans, since we knew a hefty amount would be spent on pure, unadulterated debauchery—a level we achieved on all but one evening—one of my boys tossed out the idea of a plantation tour. Now, I’m from the South. I lived amongst cotton fields for much of my youth even if it was such a part of my daily existence that I never even noticed them. And as you can probably imagine, Alabama is home to a significant number of plantations, with many of them listed as national historic places. In the region I grew up in, there are apparently at least 10 plantations within an hour’s drive of my house and two in the county I lived in. While I never visited one near my home in high school, I do remember visiting a plantation outside of Birmingham, Ala., once. And I’ve visited George Washington’s Mount Vernon estate, which is a plantation. Yay, America. I’m a fan of history, especially black history, so while visiting plantations is rarely high on my list of things to see, they’re about as important to black American history as you can get. So when the idea was suggested, I initially scratched my chin, but after some quick thought, I was all in. And I’m very glad that it was suggested and that I went. Oak Valley is a beautiful estate. The history is terrible, but the actual home and property, and the seemingly endless walkway covered by oak trees is breathtaking. It’s the kind of thing you hate to like. Fortunately, this plantation (as well as others; the Whitney Plantation now houses a Slavery Museum) focuses as much on the lives of slaves and attempts to tell as much of their story as possible. In fact, even on the tour of the “Big House,” the guided tour is about 50/50 on what life was like for the family who owned and ran it versus the enslaved working inside and never wavered from their story in parallel to the owners. There’s even a lengthy talk held outside of the slave quarters about the history, work and eventual emancipation (some through manumission, fleeing or the end of the Civil War) of the slaves. There are eight slave shacks carefully maintained (or reconstructed) as well as endless artifacts to illustrate how hard life was. The whole thing was sad. While I appreciate the care taken to tell their stories, I still felt pissed and annoyed. It’s impossible for me to separate the historical value of their preservation from the fact that they even exist in the first place. In fact, the trip reminded me a whole lot of when I began fully noticing the cotton fields of north Alabama. They’re beautiful, yet painful. It’s history but its a terrible reminder of this country’s past. It’s Rosewood, everyday. Oak Valley and the Whitney Plantation (which we didn’t see) and others I researched that center the slaves as much as the owners, also made me wonder how the plantations in Alabama tell the stories, because I’m not as optimistic about the slaves being as focal. Even at Washington’s Mount Vernon, I found myself as the only black person near and far who I saw the whole time we were there and heard the tour guide talking about how good the slaves had it until he saw me and quickly corrected himself to ensure that he’d never suggest that it was a good life or OK. 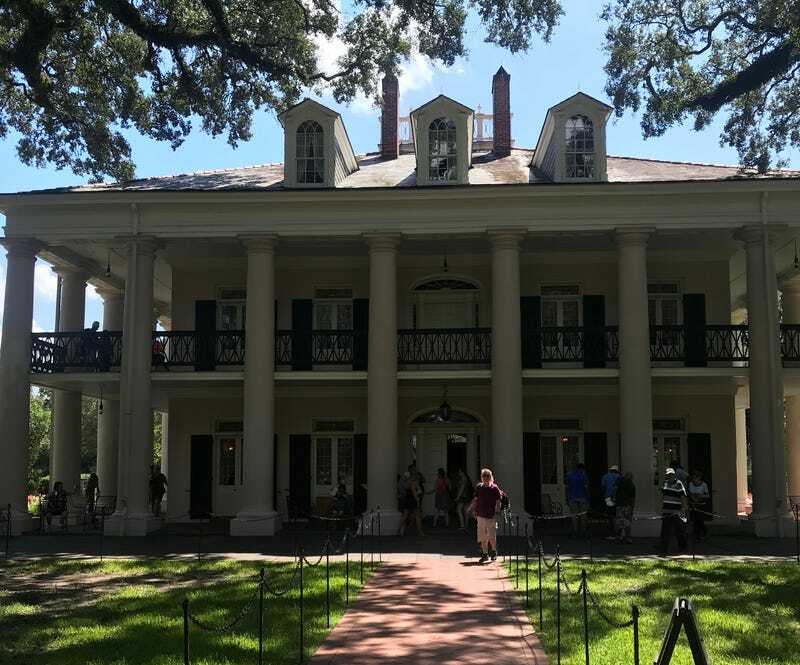 But after going to Oak Alley and passing the other plantations that I am now very much interested in visiting on my next trip to New Orleans, I feel like as painful as the experience may be, I should go visit them and learn about the lives of those enslaved there. I have no idea where my father’s family entered America or what plantations they were tied to and will likely never know. So it could have been from anywhere. Maybe I was standing on ground that once housed some of my own family. Those plantations are as much a part of my history here as any white person who profited off the labor. Surprisingly, I left fuller and prouder than I arrived.